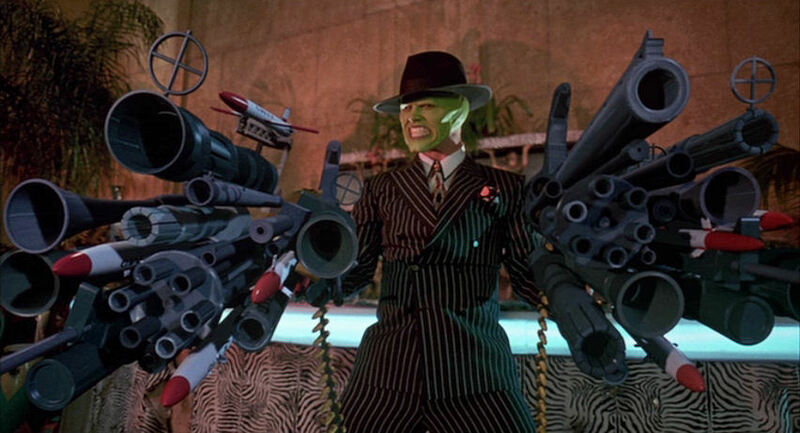 Halfbakery: 4 guns at once! The gangsters shooting pistols with both hands has been done a ton. Where to go from there? How about more pistols? I propose that a gangster (or possibly a cowboy) with large hands could hold one pistol rightsideup in the conventional way and a second upsidedown with the same hand, with the pinky finger activating the trigger of the upsidedown one. One could attach the butts of the pistols together with carpet tape if desired, or screws if you were going to do this regularly. With 2 guns in the left hand and 2 in the right, this doubles the deadly! It also quadruples the killing. This was why the MAC-11 was developed. There are so many reasons why this just won't work. OK, what about a pistol-grip from which sprouts a florescence of 5 mini-guns, each with it's own digit-based trigger. A gangsta or other dualista could sport two of these, providing 10x the tin! Going a step further, gun-shoes could also be added to the ensemble, providing another 10 bullets, each individually triggered by movement of a toe, earning the incumbant a 20x advantage over the uni-pistolled adversary. Those who may sniff at a mere 20x advantage, may be interested in the nasal-gun, controlled by puffs of air measured in each nostril, the nose gun adds another 2 bullets to the arsenal. Arsenal? Yes, that's right - using a patented sphincterlock mechanism, it's also possible to mount another gun to cover the rear, so to speak. That's 23x the rifling! So, when the one gun goes off a split second before the other, you're going to aim it, how? /you're going to aim it/ Explain that "aim it" piece for me some more, please. /sprouts a florescence/ that sounds like a custom job, whereas the scheme as proposed uses off the shelf pistoles as are commonly available to gangsters / cowboys. /Twice the gun = twice the recoil/ For which one must be twice the man, which would be the take home message on viewing the action hero performing the described feat. 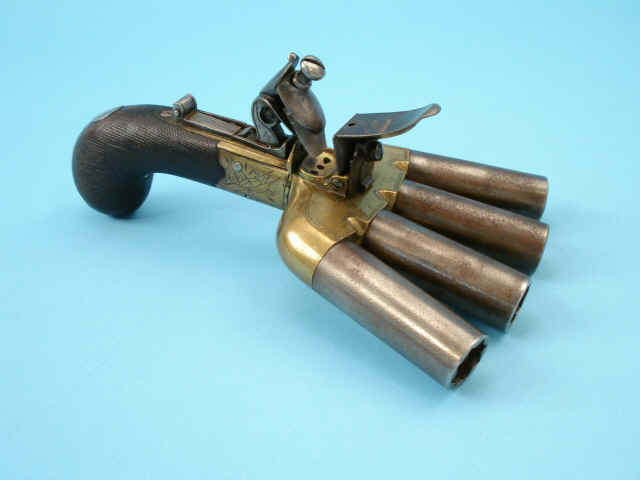 That little gun linked by ldischer makes sense - I read that pirates back in the 1700s often carried 6 or 7 pistols - each fired once and they took time to load, so that is how you got more than one shot. Howabout just the one gun, that actually hits the target? /the target/ If you have only one target, you should be able to rely on your kung fu. Or just stare the dude into submission. Antonio banderas had a gun codpiece in one of the sequels to desperado. All, presumably, prised from the cold, dead hands of their former owners, and therefore an excellent means of advertising exactly how badass you are. not necessarily, if westerns and gangsta movies start using this technique, without the recoil of a gun, and without the need to hit their target, and look badass doing it, then real murderers and psychopaths might try and do it, only to find it completely useless, after wasting their ammunition and warning nearby civilians of their presence. Trying with anything heavier than a .22 would cause one or both guns to spin out of the shooter's grasp. I've seen trick- shot artists perform what is now commonly known as the 'Bourne shot', with a single handgun held inverted and fired with the pinky. I've never tried it, nor will I.
I've also seen trick-shooters use a pistol in each hand. Almost always, they were firing both guns at the same target. Only once have I seen a particularly talented shooter hit different targets with each gun, but these were aimed shots fired sequentially at fixed targets, not simultaneous shots fired while spinning around and leaping through the air. Let me be the latest in a long line of 'bakers to state that this is a really bad idea. If I saw it in a movie, I'd drive to Hollywood and beat the director senseless with a rolled-up copy of the script. That was because pistols back then only fired a single shot and required a minute or so to reload. Yes, they 'carried' 6 or 7 pistols, in bandoliers, under their belts, or tucked into pockets, but they only drew and fired them one at a time. Pistols with four, five, six, or even more barrels have been baked for several centuries, with many examples on display in museums. Known as 'decksweepers', 'pepperboxes', 'brawlers', and many other names. /anything heavier than a .22/ Maybe the key here is to use very large caliber guns (because of course that is what you would use) but special bullets carrying 1/10th of a normal powder charge. For target purposes this would be just as good, but would leave digits attached to fingers. If your trickshooting display suddenly had to turn deadly (eg: CHUD come) the 1/10 charge would still sting like heck from up close. It occurs further to me that these low velocity large caliber bullets might leave a nice imprint on anyone they hit, and so could have insignia on the nose, sort of like the Phantom's ring but you wouldn't need to wash the bad guy aftershave off of your hands later. Okay, that's a pretty good idea. I mean, it's still a really bad idea, but now it's so bad that it's good. No bun, though. I take firearms too seriously, and I can't shake it, even in fun. Baked-in-fiction, most prominently by Neal Stephenson in 'Daimond Age'. Proposal for an 'improved' pepperbox gun - moved to its own idea.